Look at above illustration. 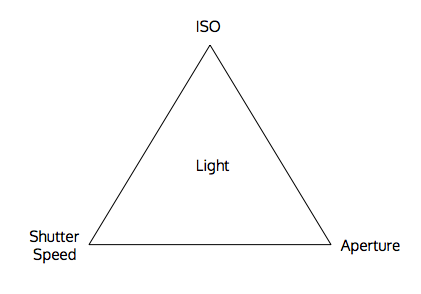 Imagine ISO, shutter speed, and aperture as 3 points that form a triangle. The size of the triangle has to always be maintained. Whenever you adjust a parameter, the triangle will enlarge or shrink. 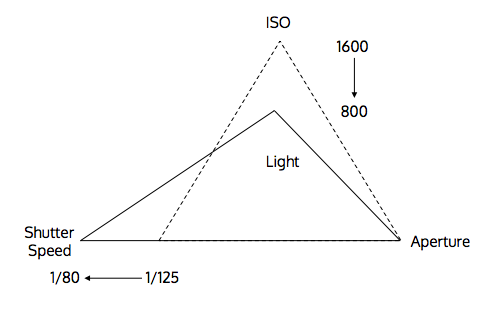 A very large triangle will result in overexposed photo, while a very small triangle results in underexposed photo. Therefore, to compensate change in one parameter, the other parameters need to be adjusted to maintain the triangle’s size. Boosting sensor’s sensitivity will increase the amount of light received. However, it will introduce noise to the photo. Fast shutter speed will capture very little amount of light and enable you to freeze moving objects. Meanwhile, slow shutter speed will cause motion blur if objects are moving faster than your shutter speed. Greater amount of light can enter through larger lens’ opening. It will also result in noticeable depth of field, also called bokeh, separating your point of interest from background. Each effect of parameter changes should be taken into account when you take photo. Are you taking landscape, portrait, travel, sports, or night photography? See below cheat sheet as a reference. You may be overwhelmed initially and feel tempted to switch back to auto. However, with enough practice, you’ll soon get used to it. Learning how to manipulate the exposure triangle will enable you to experiment with effects and produce stunning images! It’ll be worthwhile and enrich your photography experience. Previous Previous post: Reality Check on Amway: Is It a Scam?